The Challenges of Placing Your Parent in a Nursing Home - Take Action! The Challenges of Placing Your Parent in a Nursing Home – Take Action! Long term care (LTC) is a term that has many meanings to its definition. It is comprised of a variety of services that meet medical and non-medical requirements for people who cannot care for themselves for long periods of time. It is a highly individualized care system which can be formally or informally provided. Formal facilities that provide long term care go by various names such as residential continuing care facility, nursing home, assisted living, memory care and personal care facility. Informal long term care is often provided, in its earlier stages, by a family member who is willing to provide their parent personal care, meals, laundry services, housekeeping, and transportation services to and from appointments. When the time comes for your parent to be placed in a formal long term care arrangement things can get complicated very quickly. If a parent has not planned for their own aging process finding the right facility that accepts their healthcare coverage can be daunting. If a parent has very little income and assets, they may be able to qualify for Medicaid. However, because Medicaid has strict income and asset requirements, this can leave the spouse at home with very little to live on. It is important to engage an elder law attorney to help make a decision about Medicaid eligibility. An elder law attorney may be able to protect more assets for the parent who remains at home through legal planning strategies. If the family home or other assets are not protected in advance of the “5 Year look-back” period the family could lose everything. Conversely, if a parent is very financially stable, then it may be possible to pay the $15,000,00. per month cost to a nursing home but that can quickly add up and leave the community spouse and children at a HUGE financial loss. Because years of paying thousands of dollars a month can severely impact their savings and ability to leave a legacy to their children. With proper legal advice, a plan to pay for care without losing everything is possible. What if your parents are financially stuck in between? It is another type of sandwich, called the “financial sandwich” – seniors not poor enough to qualify for Medicaid but not wealthy enough to cover their own costs. There are still options available to those who fall into this category. It is never too late (or too soon) to talk to an elder law attorney about options to find and pay for long term care. Long term care is becoming more expensive and less accessible as the increasing baby boomer population continues to put a strain on the U.S. health care system. Now is the time to engage your parents in discussions about the type of care they would want if long term care is needed, including where they want to receive the care, and how it should be paid for. It’s important to document your parent’s wishes in appropriate legal documents that name an agent to make decisions if your parents are unable to. We would be happy to help you and your family navigate these issues and come up with a plan to make sure your parents get the best care possible without losing their life savings. 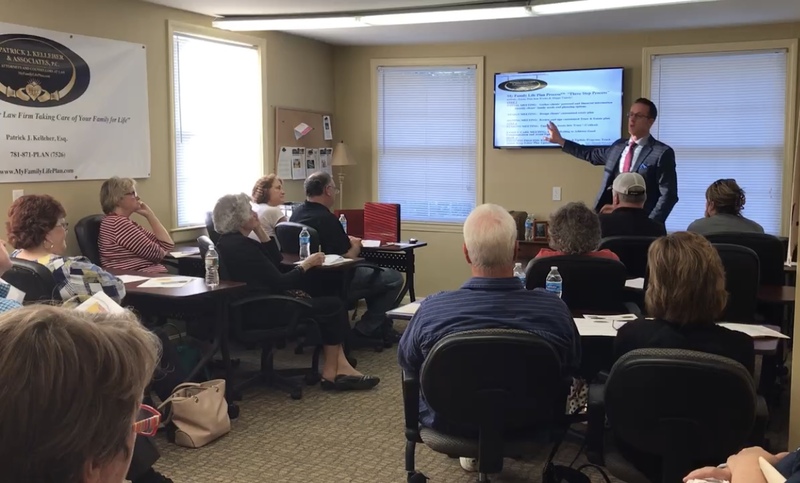 Next steps: TAKE ACTION now and attend our FREE educational Estate Planning & Elder Law workshop by calling 781-871-7526 or email pat@elderlawcare.com because seating is limited and our Learning Center fills up quickly!